Every General Conference we frame the following print and write (in wet-erase marker on the glass) the conference talk topic under each apostle/prophet to have hanging in our home for the next 6 months. It’s a great reminder of the principles and doctrines the prophet and apostles teach us. It also makes for an easy review for FHE. Our children have become more familiar with names and teachings as we have reviewed these messages with them. 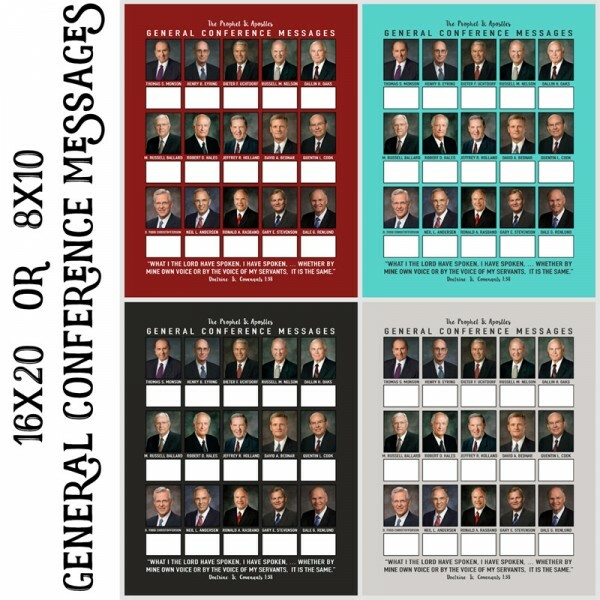 16×20 (can also print easily as an 11×14 and 8×10) with Prophet’s and Apostles with Space for Conference Message. I suppose there is one benefit of being sick… resting on my bed with a laptop on a Sunday gave me a few minutes to put together these pages. 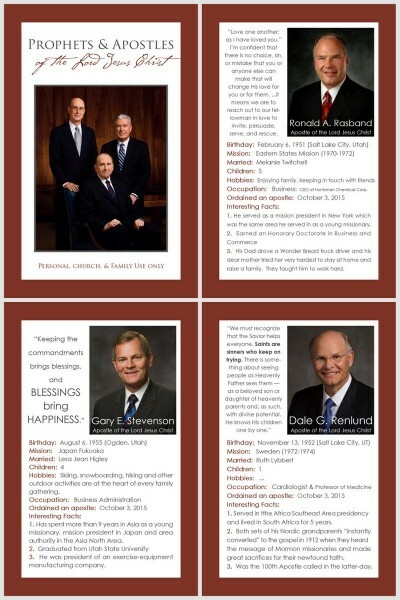 As more information becomes available about these 3 newly called apostles, I’ll update the info on their cards. 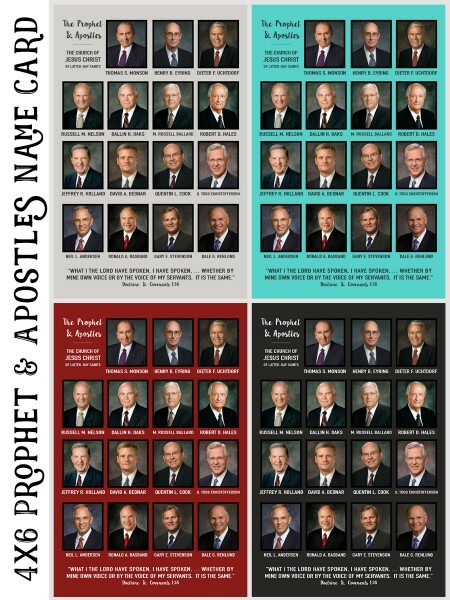 For now, enjoy learning about these new apostles. And if you have a few minutes, listen to this Mormon Channel Conversation with Elder Rasband and his wife. I loved learning that one of his gifts is having dear friends and one of her gifts is loving others! 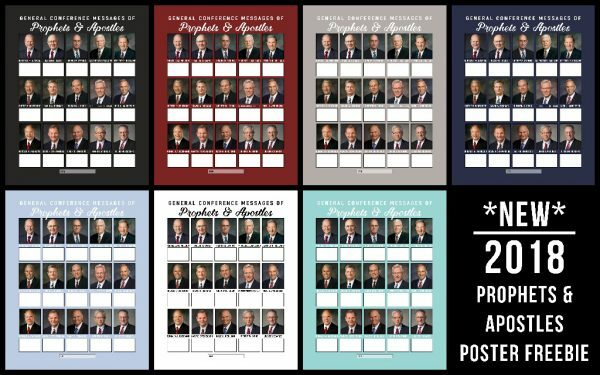 Please see updated 2018 Prophets & Apostles General Conference Freebie Printable post here. 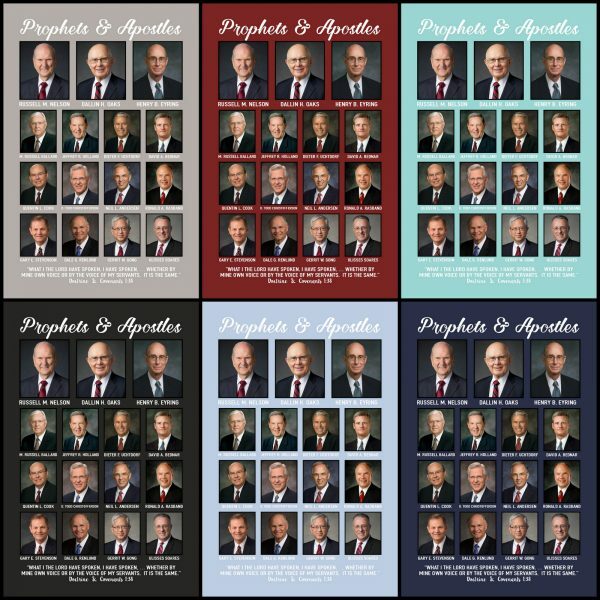 We are in the middle of a huge move out of state but I squeezed in this additions to the prophet & apostles General Conference Message & Name Card with the 3 newly called apostles. I’ll try to put together the new info for the apostles 4×6 quiet book when I have a restful moment. 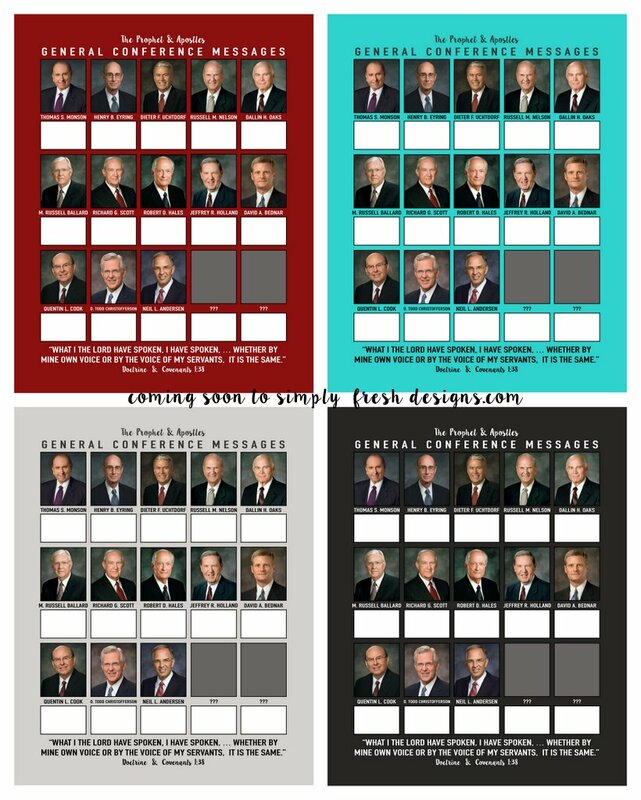 Every General Conference we frame the following print and write (in wet-erase marker on the glass) the conference talk topic under each apostle/prophet to have hanging in our home for the next 6 months. What a great way to keep the word of God close to our heart and mind! P.S. I’m starting to put all the freebie downloads for quiet books and such on Dropbox as a public folder. Feel free to download anything in that folder for personal or church use. Due to the recent passing of apostles L. Tom Perry and Boyd K. Packer, we anticipate that new apostles will be called during General Conference Fall 2015 for the Church of Jesus Christ of Latter-day Saints. In the past, my family has written the conference message topics on the glass of a 16×20 framed Prophets and Apostles print. I updated the style and layout for the new changes. Shortly after the new apostles are announced, I’ll update and share this as a freebie. Just wanted to share! Receiving answers to prayer has been on my mind lately. I know that Heavenly Father answers prayers. A prayer of mine was answered today. He blesses us in so many ways. 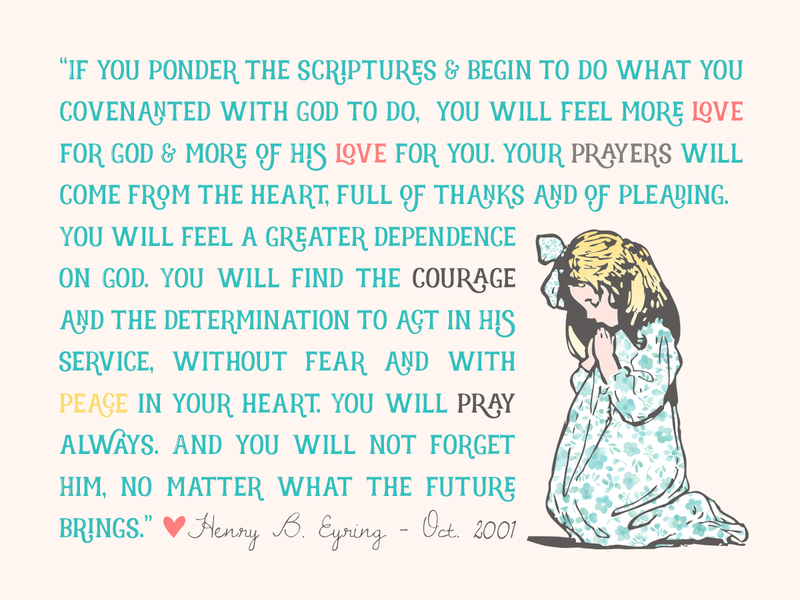 Wanted to share a freebie that I love about prayer. It teaches me there is POWER in prayer. 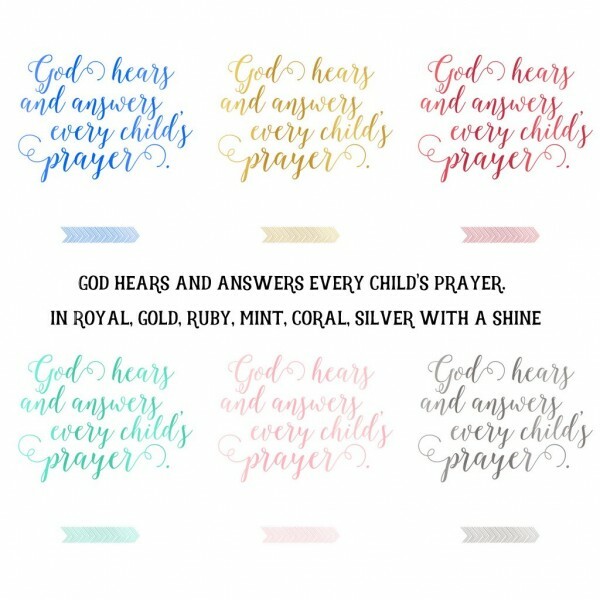 Also, new in the shop, God Hears and Answers Every Child’s Prayer… with a bit of shine! 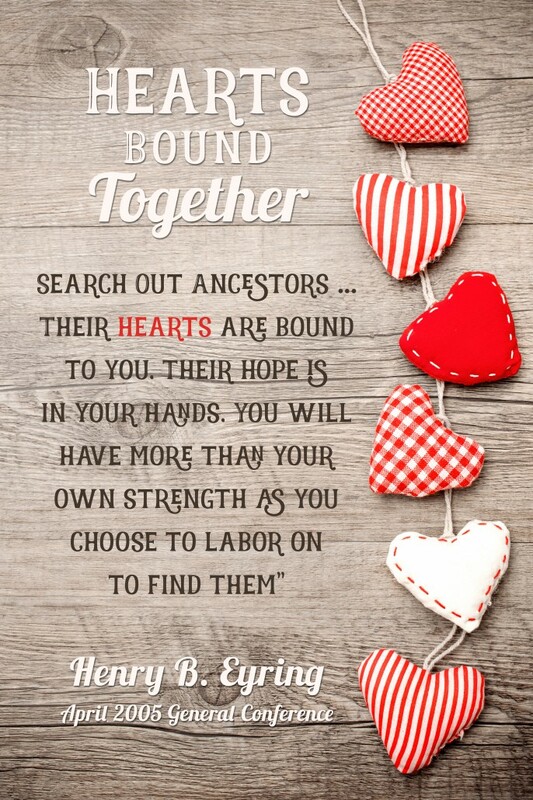 Recently, I’ve been reminded of the importance of connecting with our ancestors. Our connection to them is eternal. Knowing their photos, their lives, their triumphs, and challenges can strengthen us. in hopes that we will endure to the end as they tried to do. 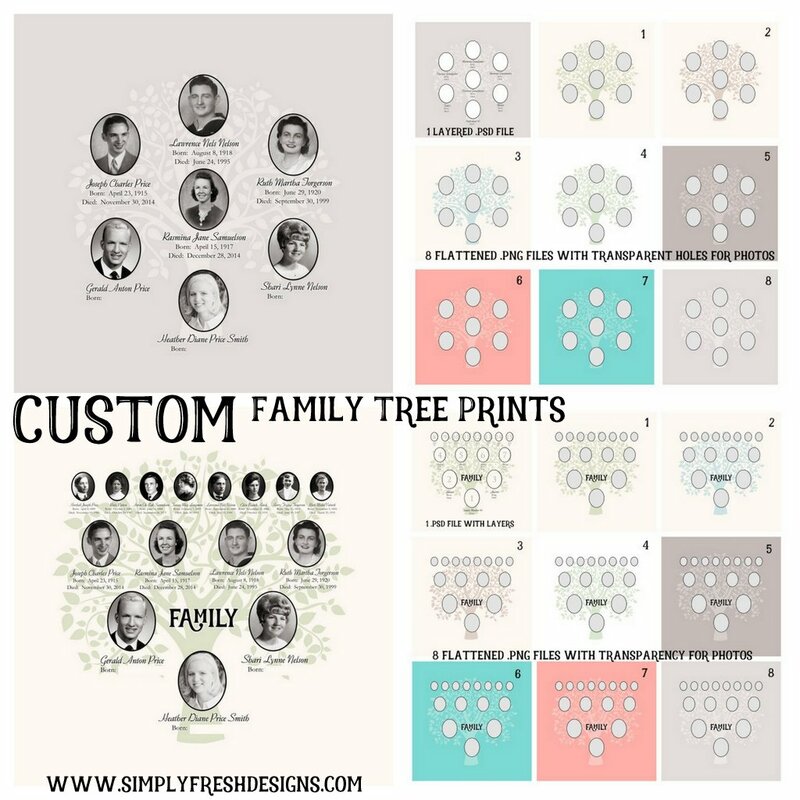 I decided to redesign my family tree prints to display in my home. I wanted to share them with y’all to display in your home. Your family will have the opportunity to become more familiar with ancestors. Didn’t we all love to go to grandma’s and see the pictures of ancestors from the olden days? We are bound together with them in ways we don’t understand. as a member of that family. *New* in the etsy shop today. This 4-generation tree is my favorite. Those photos from the early 1900s are splendid. I LOVE my family! I’m working on gathering photos of my husband’s side of the family so we can hang ours side-by-side. 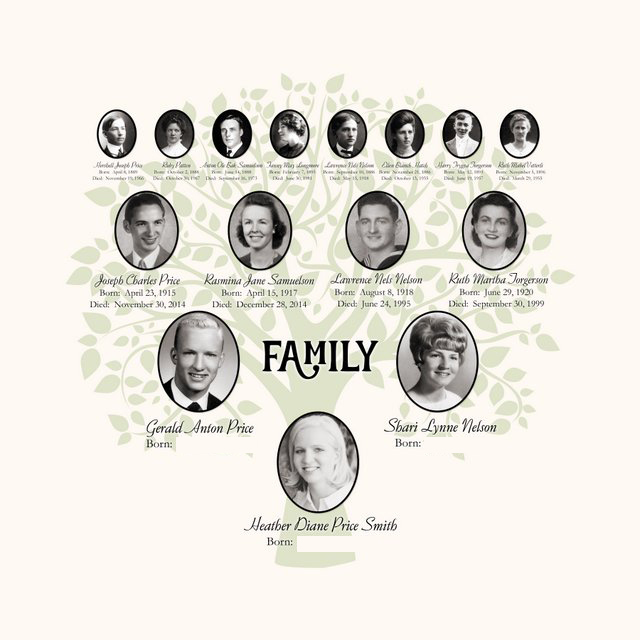 Please see individual listings for more details about the Custom & Design your Own Family Tree listings. Also Updated: Simply Fresh Designs Etsy Store Policies which also explains more about buying and downloading digital files. 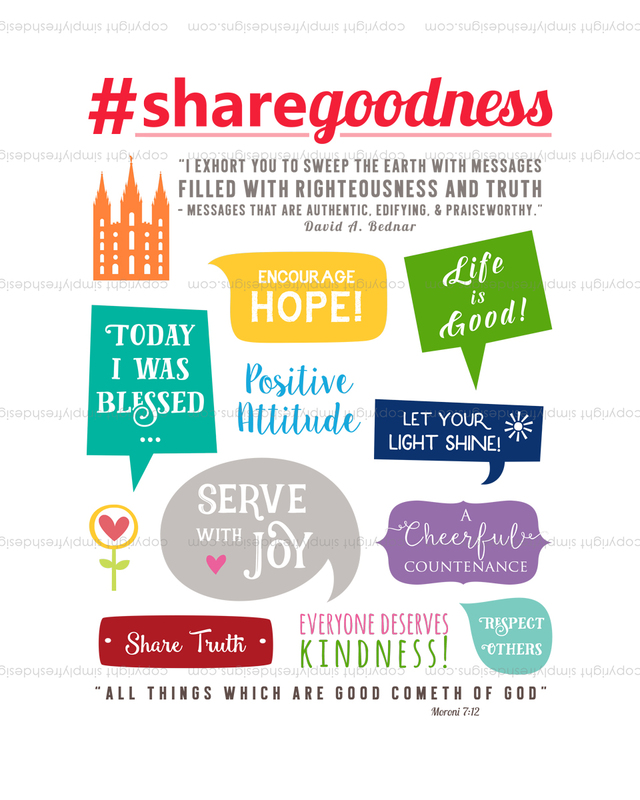 This new #shareGoodness Print is based on a message shared by David A. Bednar’s “To Sweep the Earth as with a Flood,” BYU Campus Education Week devotional, August 2014. 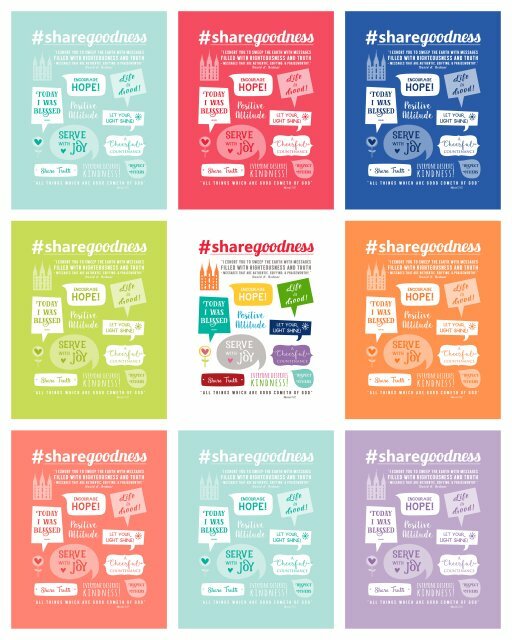 This print will help remind youth and adults alike to use social media in a positive way. It shares ideas for ways to Shine your LIGHT! Display this print in your home. Many moons ago one of my healthy-eating sisters had this idea for a fridge-chart to encourage kids to eat more healthy foods each day. I ran with that idea and eventually came up with this next set of free downloads. This chart is especially for Littles (age 2-5). 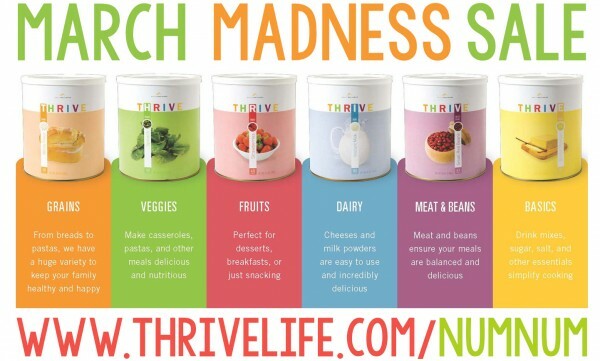 The idea is to encourage them to eat various healthy foods each day. I laminated the 8×10 chart. 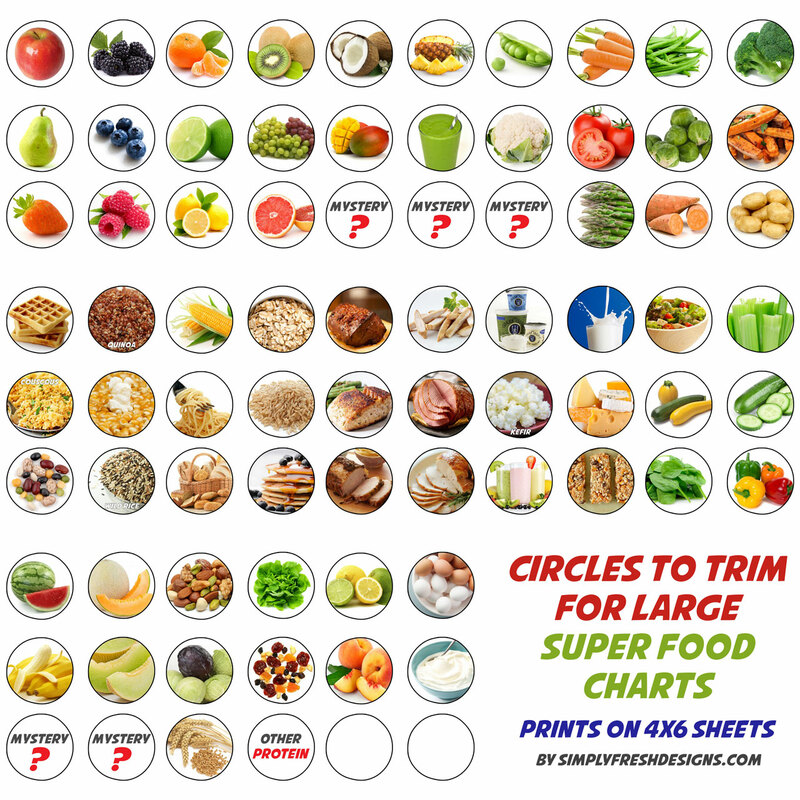 Laminated all the 4×6 food circle sheets, trimmed them to circles. 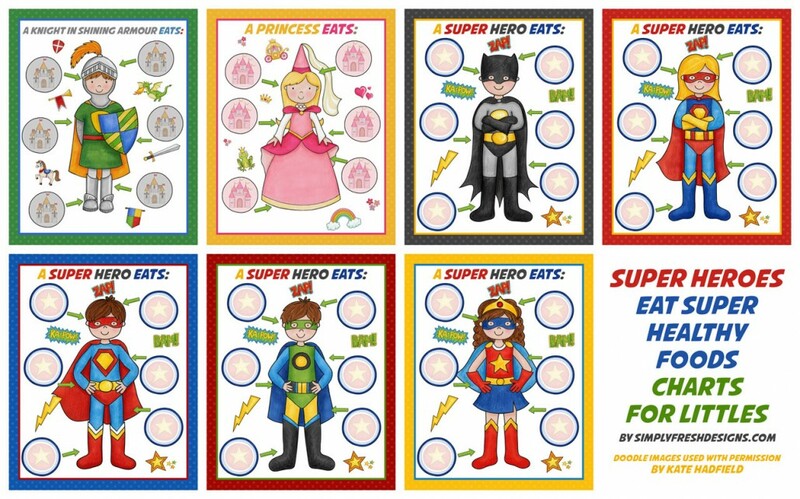 You can attach the circles to the chart once the child has tried that food. Use mounting putty or velcro dots to attach the circles. Every day… or every meal (whichever applies!) remove the circles and start over. My kids enjoyed finding the food circle and sticking it on. This system helped my 3-year-old try Quinoa (this was a HUGE deal!!!) It helps us keep things positive and fun at dinner-time. I soon realized that many circles of food and many children = lots of possible circles on the floor + not enough circles of same foods for my 6 kids unless I printed them each a set which = yet, even more circles all over my house. So… to simplify (and also for use for my older tweens), I included our most-likely-to-eat foods on one chart. 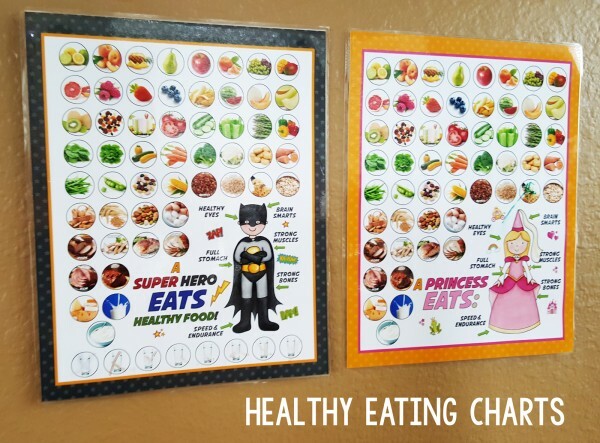 I laminated these charts and we can use wet-erase markers or stickers to mark foods eaten for the day/week. 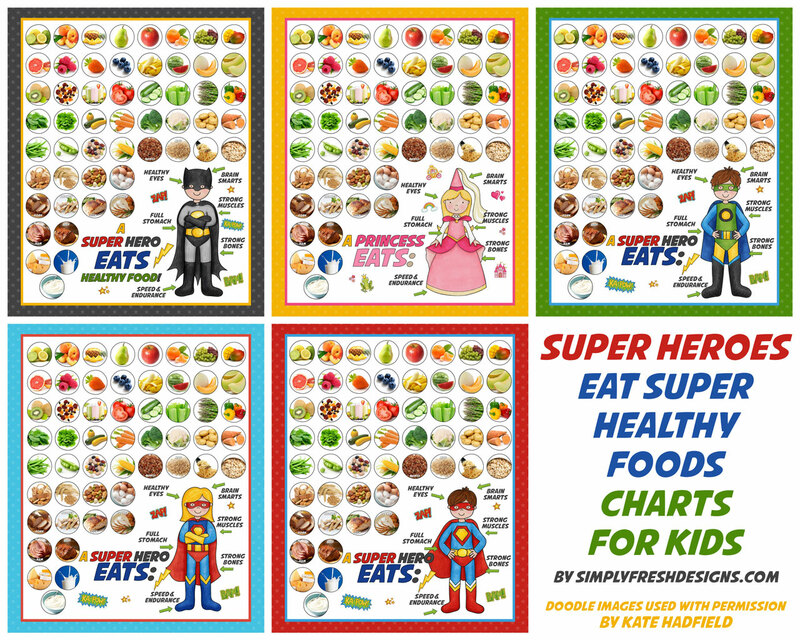 I would recommend using these charts for a few weeks at a time when your kids need a little extra encouragement to eat those healthy foods! Long-term, I imagine they will lose their zest and become monotonous for little kiddos. So… hide them away, and bring them out in a few months when fresh produce is available in-season. *Disclaimer… I realize this is not a complete list of healthy foods… and perhaps some would disagree on how healthy some are. 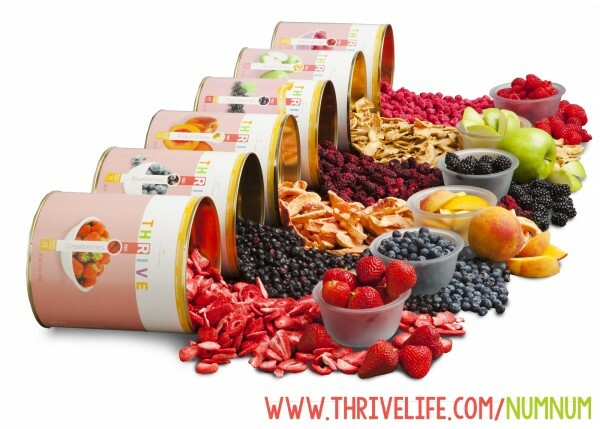 If you find you need other foods, I have included a few extra blank large circles so you can add your own foods that fit your family’s health needs and wants. Please share ideas in the comments and perhaps I’ll make a version 2 to share. Go Forth and Eat Well!